As we begin Holy Week, we continue our Lenten journey that began on Ash Wednesday by praying, fasting, and giving alms. Lent provides a special opportunity to help others be transformed by hope. Our St. Constance School has an incredible legacy of love that transforms the lives of children with hope. Generations have been taught the value of faith through St. Constance School and our religious education programs. That faith helps to support our students throughout their lives and continues to inspire them to be the best versions of themselves. A beautiful example of this love, faith and sacrifice is the journey that Sandy Baranski, class of 1976 has taken. Sandy is recovering from surgery after donating a kidney to an extended family member two weeks ago. Both Sandy and the recipient are healing and on the road to full recoveries. Please keep Sandy and her family, as well as all the sick and suffering in your prayers as we move towards the celebration of Easter. Visit http://www.cyberdriveillinois.com/programs/organdonor/home.html to learn how you can help life go on. During the last week of February, the four-year-old students in Mrs. Krause’s pre-school class participated in the “St. Constance Step Up” program. Step Up participants spent some quality time in Miss Moore’s Kindergarten class for a taste of what life will be like next year after they graduate from pre-school. The soon-to -be Kindergarteners visited Miss Moore’s classroom in pairs and were guided by their experienced, older friends as they explored the exciting world of higher education. 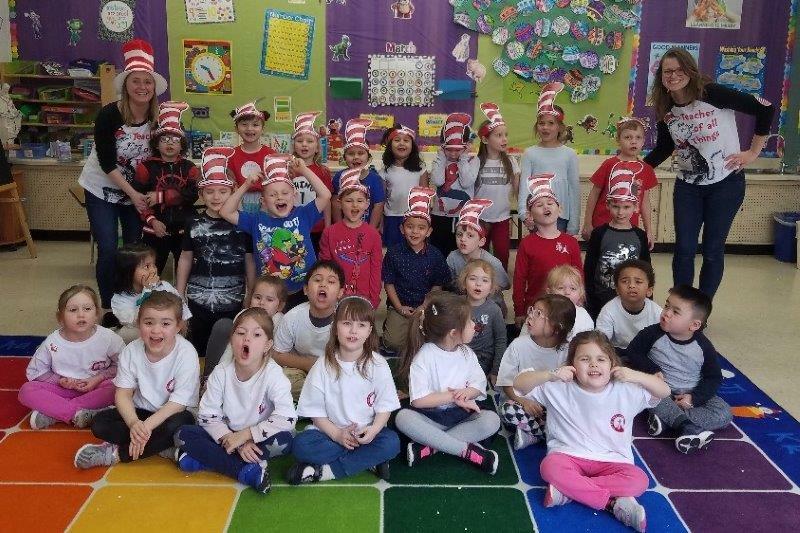 At the end of the week, both the pre-k and kindergarten classes celebrated Read Across America Day and the birthday of Dr. Seuss by reading some of the Doctor’s best loved works and wearing hats that honored everyone’s favorite feline, The Cat in the Hat. The pre-school class of 2019 were also presented with their first ‘graduation shirt’ which lists all their classmates’ names on the back and their year of 8th grade graduation from St Constance 2028! Fun and excitement abound at St. Constance. Please join us in supporting your alma mater. It's a sign! Word out on the street is that St. Constance is building successful futures one child at a time. We have a sweet treat for the first member from each class that posts a photo of the new St Constance banner on Facebook, Twitter, or Snapchat. Alumni Memories Reminisce with a 2010 St. Constance School graduate, who is a lifelong parishioner and is a Teaching Aide at St. Constance School. Click here to see who she is and take a walk down memory lane with her. Class of 1919 One Hundred Year Reunion! It is time to get together with classmates and relive the memories of your youth. The event will be held at the Century Club located on the 100th floor of The Willis Tower. For further information and make your reservation, contact Diane at 773-283-2311. Class of 2018 one year reunion- so eager to graduate but miss your friends? Join the Class of 2018 at The White Eagle to relive the memories and talk about high school. For further information and make your reservation, contact Diane at 773-283-2311. How did you spend your summers? We agree, there is nothing like enjoying a few of those long, lazy days hanging out in the back yards or riding our bikes to Jefferson Park for open swim hours. But really, a kid only needs so many of those days, and mom and dad need to get to work. 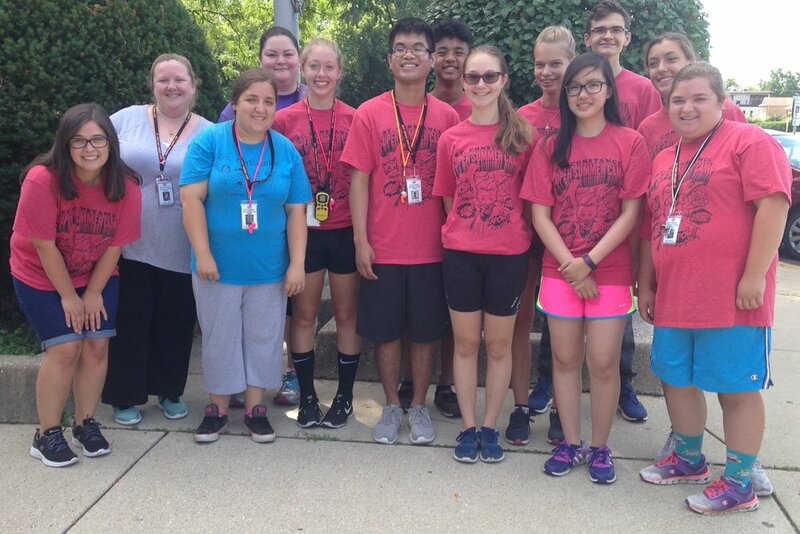 A group St. Constance alumni along with Mrs. Mikrut and Miss Blecka are about to conclude the 5th year of St. Constance Summer Camp, and you should check it out. www.scsummercamp.weebly.com. Mrs. Mikrut and Miss Blecka hire alumni as counselors and current students as counselors-in-training. It’s a great way for young people to learn and earn, while serving their community. Do you recognize anyone from this picture? Left to right: Jen, Class of 2005; Jenny, Class of 1993; Colleen, Class of 2006; Mary, Class of 2011; Gabby, Class of 2015; Carlo, Class of 2010; Matthew, Class of 2018; Ola, Class of 2018; Emily, Class of 2018; Ysabelle, Class of 2017; Alex, Class of 2017; Giorgia, Class of 2014; and Erin, Class of 2010. Did you attend St. Constance between 1995 and 2002? Yes? Then surely you remember Father Andrew Izyk! Father Izyk is returning to St. Constance to take up senior citizen residency where he will assist our new Pastor, Father Rich Milek. Father Izyk is excited to be back “home” on Strong Street and is looking forward to renewing old acquaintances and making new friends. Connie Stance, Class of 1975, was recently promoted to President of Hey Zuess Industries located in City. Ms. Stance began her career with Hey Zuess in 1985 as an intern. She rose through the ranks after impressing the owners with her handwriting. Ms. Stance lives in Jefferson Park with her husband and five children who are also St. Constance alumni.